Complete Rules For Adventures in Victorian and Edwardian Fantasy and Science Fiction. Remember how the future used to be? When vast fleets of flying ships blackened the sky . . . When psychic investigators used electric pentacles . . . When Venus was a paradise, never fallen from grace . . . When the government's main job was to make the airships run on time . . . When a gentleman could build his own spaceship and still have change of a million pounds . . . When there were still dinosaurs and monsters in the unexplored corners of the Earth . . . When you could find a complete role playing game with twelve supplements on line . . . Probably the first shareware tabletop RPG, now freeware, Forgotten Futures has been published on disk and on line since 1993. 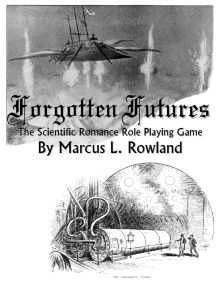 Like all of the core Forgotten Futures RPG material, this PDF is a free download. It contains all of the rules that you'll need to play the game, including many of the optional "extras" that have been added in various worldbooks and adventures. More than a hundred megabytes of background material and adventures are available from the author's web site, with much more supporting material available as a downloadable CD-ROM image. Note - most of this material still asks you to become a registered user; registrations are no longer accepted, but you can support the site (and Cancer Research UK) via donations. This title was added to our catalog on December 17, 2008.